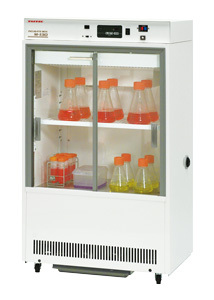 Can be used as refrigerator to store sample and reagent or for reaction in combination with small device. 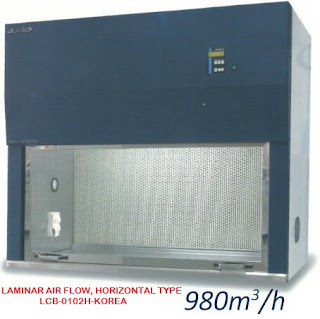 This machine can prevent turbulence of temperature due to operation of auto defrost function which may be concern while measuring test at low temperature since auto defrosting function can be OFF during precise operation (when it is not needed, auto defrost is ON). You can switch to energy saving mode when precise temperature regulation is not needed. 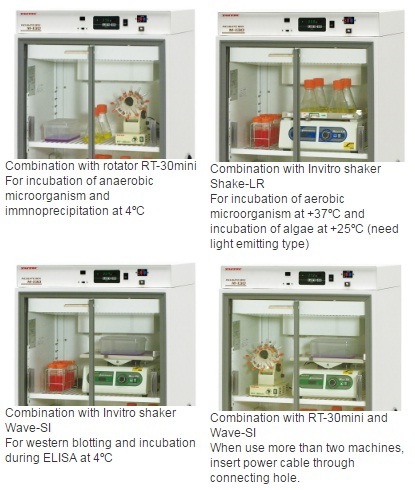 Can be adapted to various experiments by combining with shaker and rotator. It has outlet for device inside chamber and has connection hole for power cable to go out. (*) Please put shaker at bottom of the chamber when operating high speed shaking using reciprocal or rotary shaker.